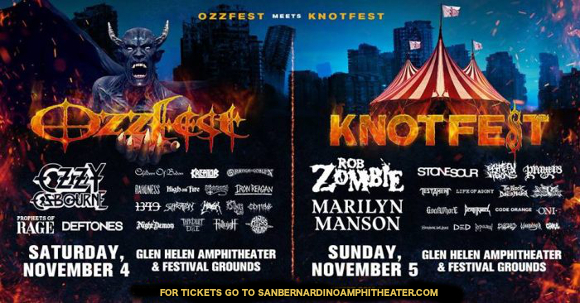 One of the biggest highlights of rock music in 2016 was the fusing of the Ozzfest and Knotfest festivals into one, 2-day glut of hard rock and metal! The union was so well received that this year, it’s happening all over again – get ready for Ozzfest meets Knotfest Saturday and Sunday 4-5th November 2017!! Get your tickets here for the Ozzfest portion of the festival, featuring Prophets of Rage, Deftones, Children of Bodom, and Orange Goblin, headlined, of course, by the Prince Of Darkness himself, Ozzy Osbourne!! Founded in 1996 by Sharon and Ozzy Osbourne, the Ozzfest is a world-known touring festival that has gone everywhere from Europe to Japan! Featuring only the finest selection of hard rock and heavy metal acts, it has gained a proud reputation as one of the greatest metal festivals in the world. Get ready to see Ozzy Osbourne, Prophets of Rage, Deftones, Children of Bodom & Orange Goblin live – book your tickets to Ozzfest today!! Hurry though, they aren’t going to last long!